How to describe this experience? I say experience because going to the theater at The New American Shakespeare Tavern is not like viewing most theatrical presentations. The Tavern adheres to the tenants set forth by playwrights and theaters of the Elizabethan period. The staging, performances, costumes, and seating arrangement all reflect theater of the late 1500 to mid-1600s. It was truly one of the most moving theater experiences of my life. The road to the Tavern began on May 16, 1984 when a group of players performed "As You Like It" for a one week run at Manuel's Tavern on North Highland Avenue. The troupe remained in this venue for six years until the doors of the current location opened. 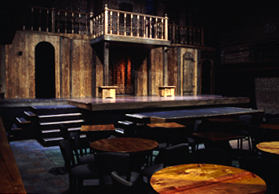 Since the opening of The Shakespeare Tavern on Peachtree Street in 1990, ASC has produced over 73 plays, presenting 1,600 plus performances including more than 30 Shakespeare titles and over 18 period classics. If you're still not impressed, in 1995 ASC was honored to be the first American company to perform on the stage of Shakespeare's Globe in London, England. In case you've never read, seen the play, or seen the movie, "Hamlet" is about Prince Hamlet and the royal court of Denmark. After his father's suspicious death, Prince Hamlet endeavors to determine the method of his father's demise and to seek revenge upon those that enacted it. To not raise suspicions about his inquiries, Hamlet pretends to be insane. This was probably not the best plan since it has dire consequences for all concerned. The details of the plot are better explained as they unfold in the play (I wouldn't want to spoil it). The performance by the ASC was phenomenal with a few exceptions. The actors and actresses playing the roles of Queen Gertrude, Price Hamlet, Polonius, and Ophelia were excellent. On the other hand, the actor in the role of King Claudius reminded me of William Shatner...enough said. While many scenes in the ASC's performance were moving; two have stuck with me since the performance. The first is at the beginning of Act 2 when the famous "To be, or not to be..." monologue is delivered. Far from the stale presentations I've seen by previous actors, this Hamlet truly conveyed his desire to be done with the world and his musings about what occurs after death. The second, and my favorite, scene involves the lovely Ophelia's descent into madness after her father's murder. Her performance was so heart rending that when she reached out to a member of the audience in the first row, the audience member reached out to comfort her. Though I've seen many different plays and musicals, nothing comes close to the quality provided at The New American Shakespeare Tavern.